There’s been a recent trend in hospitals pushing towards more baby-friendly practices and less overall medical intervention. Hospitals are reverting to more natural methods of labor, delivery, and postpartum care as the knowledge and research surrounding maternity care and women’s health continues to change and advance. This leaves a lot of questions for someone about to deliver however, especially if your personal beliefs or desires don’t match your hospital’s practices. Like, do you have to breastfeed in the hospital or is formula still an option? According to Slate, the push for “baby-friendly” hospitals is not new, but there has been a recent revival over hospitals having the status. “Baby-friendly” is a specific certification given to hospitals who fulfill a rubric developed by UNICEF and the World Health Organization to promote breastfeeding. In order to attain this, hospitals must practice rooming in (no bringing babies to the nursery), give babies nothing but breast milk unless medically indicated, and no pacifiers. So, if you choose to deliver your baby in a hospital indicated as “baby-friendly,” it’s likely that you’ll be encouraged to breastfeed. It’s a good idea to look into your chosen hospital’s practices well before you’re due to deliver. The response towards the push for “baby-friendly” hospitals has been mixed. Though many moms love the “baby-friendly” practices, others feel pressured to do things they don’t necessarily want to do. For those moms who opt to breastfeed, the push towards baby-friendly practices are designed to stimulate a strong breastfeeding relationship and to make the transition as easy as possible for both mom and baby, notes Abdur-Rahman. This includes encouraging skin-to-skin contact as soon as possible after delivery, encouraging baby to latch on as soon after delivery as possible (for both vaginal deliveries and for C-sections), having a certified lactation consultant in the hospital, and having baby “room in” with mom. That being said, hospitals shouldn’t require a mother to breastfeed before offering the baby a bottle (Dr. Abdur-Rahman notes that he doesn’t know of any that do). For a multitude of medical, physical, and cultural reasons, some women just don’t want to or cannot breastfeed and that is completely their decision, he says. And, all hospitals do have formula on hand. There are a multitude of medical reasons why babies need formula, including stabilizing their blood sugar — which is a common problem for larger babies and babies born to diabetic mothers. 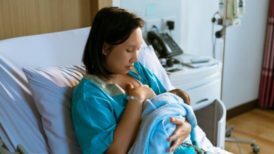 Whether or not you choose to breastfeed is not as important as being confident and vocal in your choice during pregnancy and while in the hospital for delivery. “Patients have got to feel comfortable with their doctor or midwife, as we are supposed to be their ultimate advocates,” says Abdur-Rahman. Women have got to speak up and be their own advocates, he says. “They have to feel comfortable sharing what they want and what they don’t want, as well as ask questions about those things they just are not sure about.” His one piece of advice? Feel comfortable enough with your provider to talk about anything, including your desires for your child, labor and delivery, and breastfeeding. If you are not comfortable, get comfortable, and if you cannot get comfortable, consider seeing someone else. It’s that important.